December 13, 2012 · 2:09 am.12. In an interview for The Hill, D.C.’s Congressional newspaper, Stich told me he assigned the 1966 Batman villains Republican alter-egos based on facial characteristics and not personalities. He said he would have given the same treatment to Democrats if this had been an election year for them. Inspired to do some shopping? The links to buy are below. Please note that I am not affiliated with any of these companies and share their kitschiness only out of a pure love for the genre. Filed under 1966 Batman References, Election 2012, Politically Incorrect Products, Why Can't I Be President? June 12, 2012 · 2:09 pm.06. POLITICAL SLUGFEST: Forget about the ballot box. We can now settle the 2012 presidential election like men! No one leaves the political ring without a black eye, right? 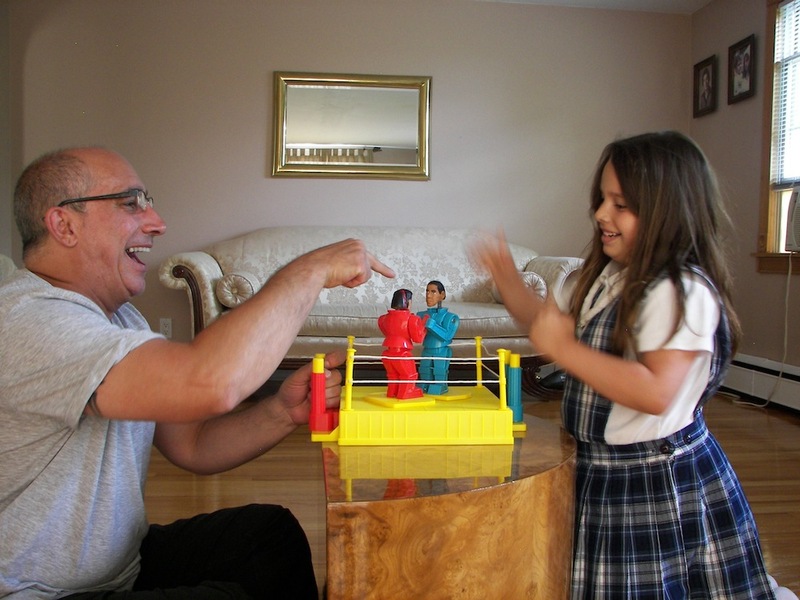 Toymaker and political rabblerouser Emil Vicale, founder of Herobuilders, just released a 2012 Presidential Election version of Rock’em Sock’em Robots — that classic 1960s mechanical boxing game that will make your thumbs more sore than any video game joystick. Vicale is selling just the Mitt Romney and Barack Obama robot heads (with surgery instructions for decapitating the old heads and reattaching the new ones) for $39.95 — or the entire assembled set for $99. 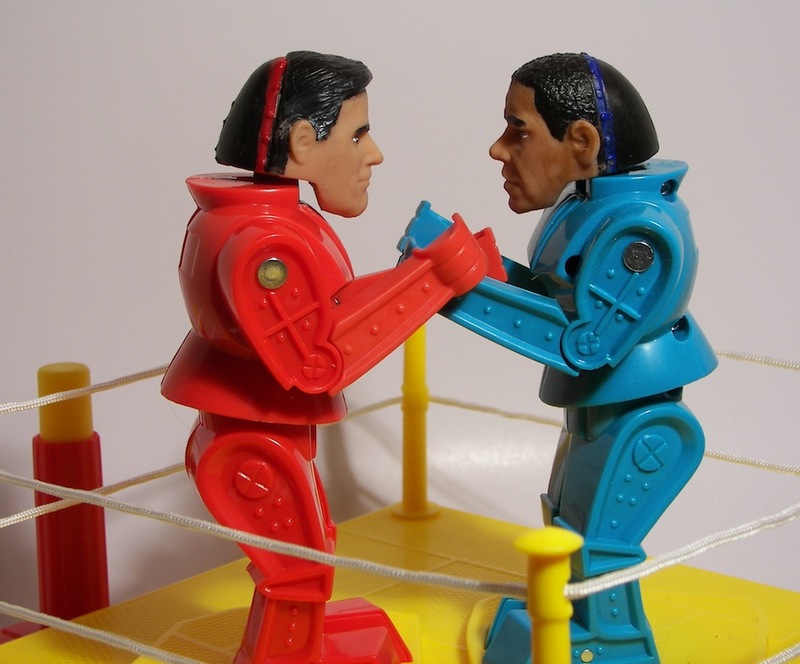 BUT WAIT, doesn’t Mattel own the rights to Rock’em Sock’em Robots? Absolutely. Vicale maintains that anyone has the right to buy an existing product, customize it and then sell it on the secondary market. For example, you could buy a brand new Camaro, trick out the suspension, add funky hubcaps and paint the whole thing hot pink and resell it as a Hot Pink Camaro. The PEZ rivals, which actually are loaded with Sprees or Mentos, come with muscular male or buxom female body attachments (superhero and corporate themes). A new way to teach kids about the reality of politics? The Herobuilders kit to modify your existing Rock’em Sock’em Robots retails for $39.95. In an exclusive interview with The Hill (modest confession: I was first to break the Obamabot story), Vicale reveals that he is NOT parodying the Washington pundits’ universal characterization of Romney as a robot. He had been planning a McCain-Obama Rock’em Sock’em set in 2008, but his idea came too late in the election season to market it. FATHER-DAUGHTER BONDING: Nothing promotes family togetherness like old-fashioned political mudslinging (or fisticuffs). 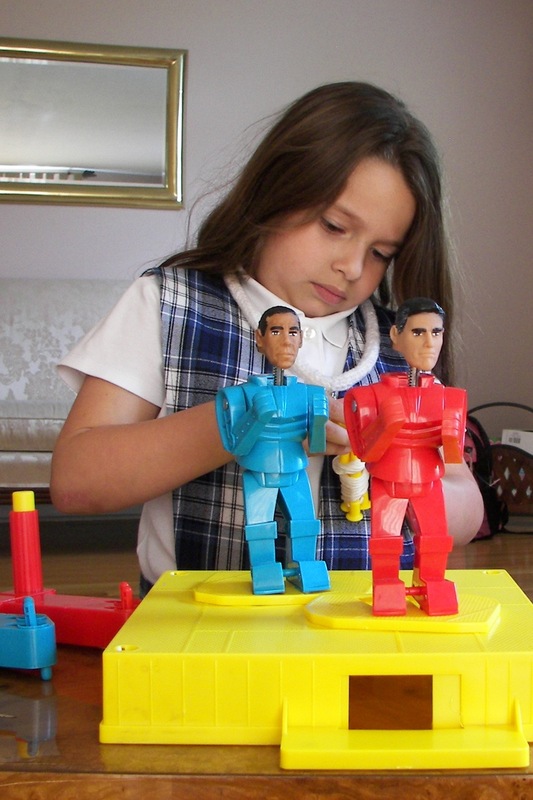 Toymaker Emil Vicale enjoys his Obama and Romney robots with his 8-year-old girl. 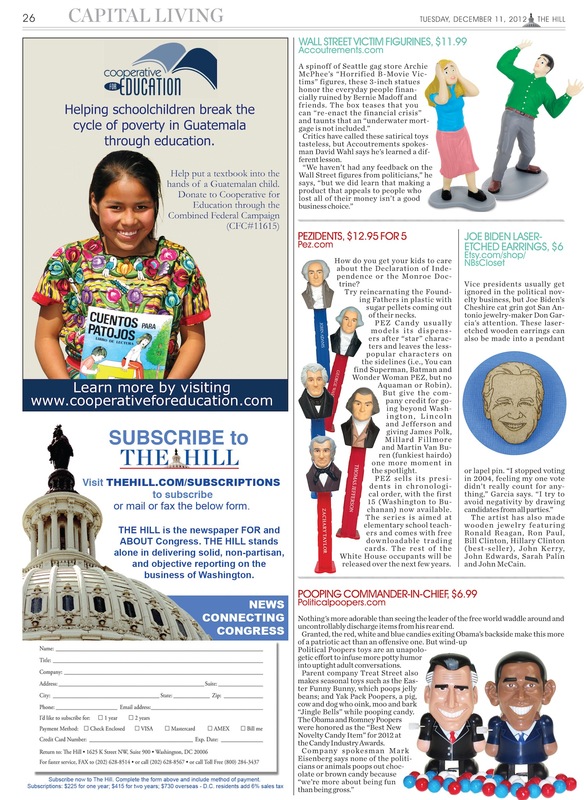 If you’re a fan of political novelty toys and souvenirs, then Vicale is no stranger. He’s also the brainchild behind the Mitt Romney Etch a Sketch doll, the Newt Gingrich action figure (everyone wants one!) and a Barbie-like incarnation of U.S. Sen. Kelly Ayotte (R-NH). Not too early to start your Christmas shopping! March 2, 2012 · 2:09 pm.03. Truth be known, my bedroom doesn’t look ANYTHING like this. My wife Stacy keeps my political sign and bumper sticker collection confined to my office and the basement. But there are kernels of truth embedded in “Primary Envy: Who Needs Super Tuesday?,” my latest humor column for New Hampshire Magazine. Why should the other 49 states have the right to vote? Can’t the candidates come back to Manchester, Nashua and Concord one more time for a rematch? P.S. I know that voters are pumped in Ohio and Georgia, but does anyone care about the results of the Massachusetts Primary right now? P.P.S. My wife and I are also the only people in our social circles who don’t have a TV in our bedroom and don’t own a flat screen TV at all. Sticking with the Cathode Ray Tube, baby! January 23, 2012 · 2:09 am.01. Newt and Callista Gingrich cuddle with Dino Flintstone on the 2012 presidential campaign trail. 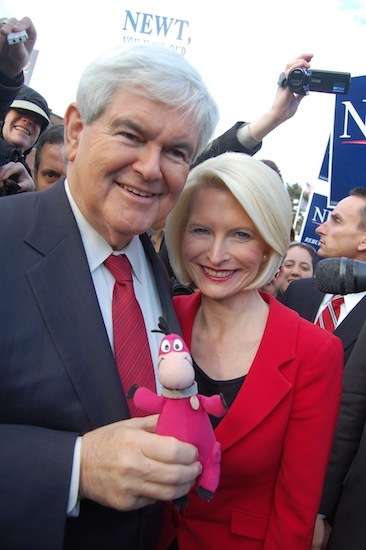 Now that Newt Gingrich has romped in the South Carolina Primary, I’m grateful that I hedged my bets this political season in my quest to get the 2012 Republican nominee for President to pose with Dino Flintstone. As faithful “Culture Schlock” readers know, GOP frontrunner Mitt Romney had waxed nostalgic about Dino while he was basking in the endorsement glow of New Hampshire’s junior U.S. Senator, Kelly Ayotte. Me: Mr. Gingrich, it’s a proud New Hampshire tradition that whoever poses with Dino Flintstone, wins the Primary! Newt: (smirks and poses) You just made that tradition up, didn’t you? Mrs. Gingrich had no comment on Dino, despite her husband’s well-known fascination with dinosaurs (he used to have a T-Rex skull in his office) and wild animals. 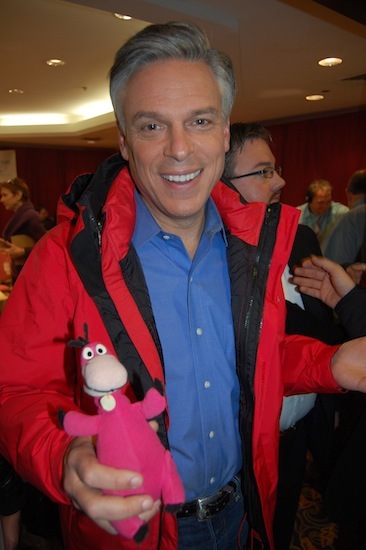 New Hampshire Primary third place finisher Jon Huntsman takes a moment on the most important day of his life to bond with Dino. I gave the same pitch to Jon Huntsman as he was rushing away from a series of radio interviews late in the afternoon on Primary Day. He humored me by posing, saying “Well, then, I guess I should be part of the tradition,” but I got the sense that he thought it was quicker to pose and move past me than to just say no. He was in a huge rush. December 21, 2011 · 2:09 am.12. Substitute your own last name for Romney’s and try to imagine yourself leading a similar song. Of course, having a large ego is a prerequisite for being President. Would you want someone who believes they are the dumbest or weakest one in the room? But egos aside, it looks like the candidate is genuinely having fun here — like he’s coming up with the campfire song list for Camp Romney. Coming to Lake Winnipesaukee soon? December 20, 2011 · 2:09 pm.12. 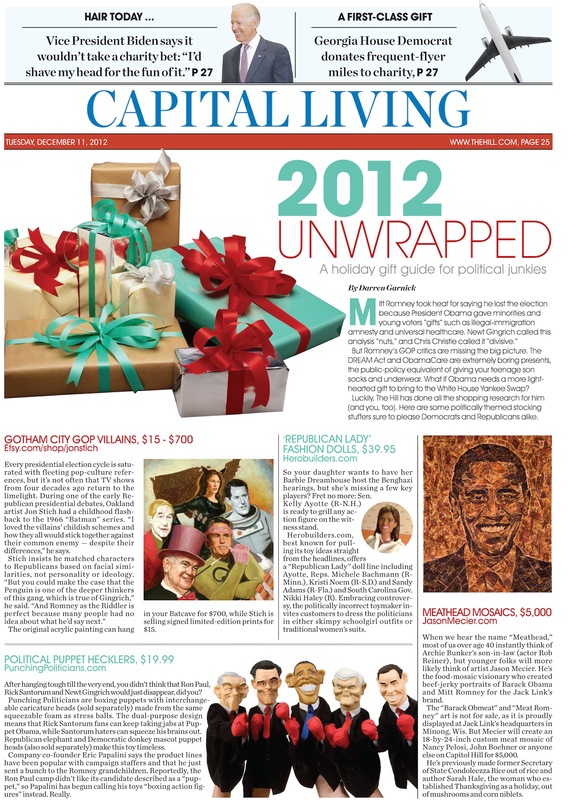 Mitt Flintstone: Does the next Commander-in-Chief need to know about cartoons? With the world watching, Mitt Romney makes eye contact with Dino. 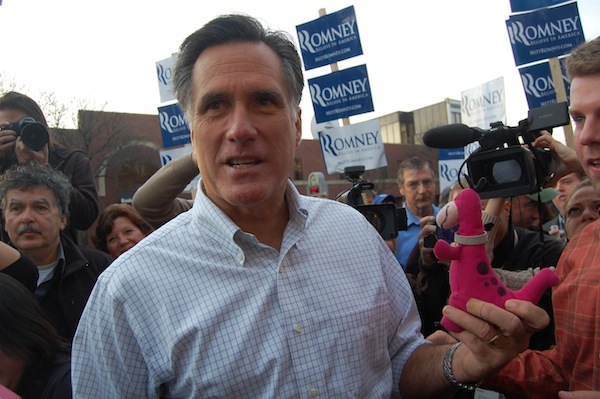 Mitt Romney holds Dino like he's doing a laundry detergent commercial. Mitt Romney boldly looks off into the distance, giving Dino hope about the future. Mitt Romney can’t catch a break. New York Magazine mocks him for never having a hair out of place, recently kicking it up a notch with “The Many Hair Styles of Mitt Romney” slideshow (they all look the same to me, no Hillary Clinton headbands in the mix). TIME Magazine just came out with its future Mitt Romney Presidential Library contribution: the WHY DON’T THEY LIKE ME? cover. And “Cheerleader Mitt,” an innocuous YouTube clip I just posted of Mitt leading a cheer about himself, has attracted some hostile commentary only seconds after going live. I’m not ready to bestow the coveted “Culture Schlock” endorsement on any candidates yet, but I don’t understand the intensity of the “Anyone But Mitt” movement. He is one of the few Republicans running in the New Hampshire Primary who is NOT a nutcake. 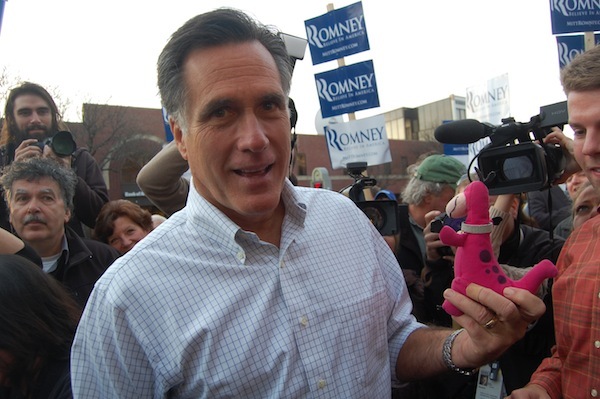 And at a recent campaign stop outside a local diner, I found Romney to be extremely likeable. He paused quizzically and then just rolled with it. “Ah, the Flintstones…” he sighed as if he were reminiscing about an old girlfriend. “I remember watching the very first episode!” As you can see from the photos above (taken on regular shutter speed, not the sports setting), Romney lingered a bit with Dino and seemed to enjoy the moment. Surely, it was a heckuva lot more preferable than answering another question on ObamaCare or RomneyCare. My friend Ilya asked him a tough question about Guns N’ Roses. And to Romney’s credit, he didn’t pull a Hillary Clinton “Number One Yankees Fan” moment. He admitted he wasn’t that familiar with the music and offered Ilya a BLT sandwich as a consolation prize. Had he picked a random song like “Welcome to the Jungle,” just to have an answer, it would have been pandering and just plain embarrassing. In Sixth Grade, I used to doodle the AC/DC and Led Zeppelin logos on my notebooks and grocery bag book covers because I thought it would look cool. If I could go back into time and change one thing in my life, it would be that. My friends would have still respected me if I had scribbled Steely Dan and Foreigner. And if they didn’t, that would have been an invaluable life lesson. But back to Romney. Do I think people should vote for him because he’s now trying extra hard to be fun and bantery on the campaign trail? Of course not. But if I were putting in grueling 14-18 hour days shaking hands with sweaty strangers, I think having a sense of humor about it would keep me sane. Besides, I kinda want a Commander-in-Chief who has seen every Flintstones episode. 2008 Republican Presidential nominee John McCain’s special relationship with Barney Rubble. The Bedrock Campaign: Fred Flintstone for President! Did the Pilgrims steal their ideas from The Flintstones? The logistics of Baseball Opening Day Hooky with Fred and Barney. Guess who’s feet look like they belong to Fred Flintstone? November 21, 2011 · 2:09 am.11. 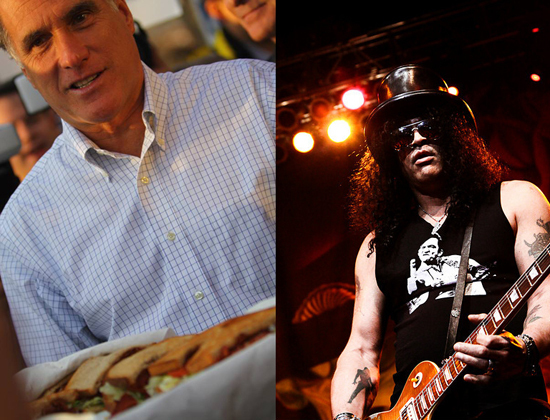 What do Republican presidential candidate Mitt Romney, who was recently serving sandwiches to NH voters, and former Guns 'N Roses lead guitarist Slash have in common? Apparently, nothing much. (Photos courtesy of Ilya Mirman). 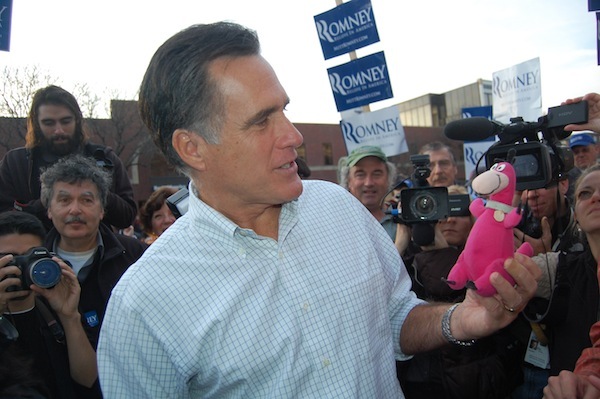 Yesterday, the mainstream media focused on action figure model Kelly Ayotte‘s endorsement of Mitt Romney. What reporters sadly missed was a candid exchange between photographer Ilya Mirman and Romney about musical tastes. The “Raw and Unleashed” reference is to a Saturday Night Live skit that makes fun of Romney for being too boring. Romney was smart enough and honest enough not to say “Welcome to the Jungle” just to impress Ilya.